Two Manitobans living with disabilities say they are frustrated with how long it's taking the Human Rights Commission to address their complaints and have decided to ask the premier for help. 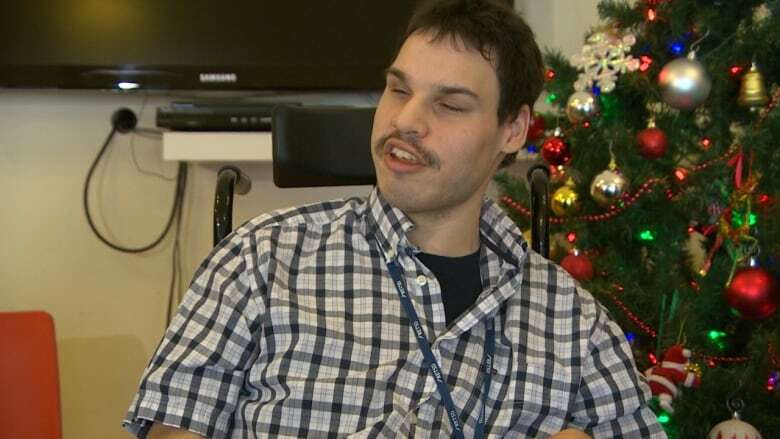 Along with their lawyer, Joëlle Pastora Sala, Tyson Sylvester and a fellow plaintiff want to form a coalition of "gappers" — young adults with disabilities who have "aged out" of programs and support that previously empowered them to be active members of society — and lobby the provincial government with one voice. They are people who fall through the cracks of public policy, says Pastora Sala. People with physical disabilities lose many supports when they turn 18 and Pastora Sala argues that's discrimination based on age and type of disability, because people with mental disabilities continue to get supports. Sylvester and another person with cerebral palsy filed complaints with the Human Rights Commission in July of last year, naming Manitoba Health, Manitoba Families and the Winnipeg Regional Health Authority and citing discrimination based on age and intellectual ability. "I was really hoping for the investigator to come back sooner and just have the answer for us," said Sylvester, who lives with cerebral palsy. "I could be in school right now. I could be getting an education. I could be getting a job. Instead I'm stuck sitting in my apartment." Sylvester graduated from high school in 2015 and used to be eligible for an array of personal and educational services offered by the Children's disABILITY Services Program, funded through his school board and Manitoba Families. He had one-on-one support throughout his schooling along with rehabilitation therapy, special supplies and transportation. The health authority has denied responsibility for the complaint because they do not administer the Children's disABILITY Services Program or Community Living disABILITY Services. Manitoba Families stated the complaint has no merit and Manitoba Health indicated it's the regional health authorities that are responsible for providing services, according to background provided by Pastora Sala. "They've said that the complaints are frivolous and vexatious and we're not sure if the premier knows that the public servants are saying that on his behalf. So we want to write to him and ask him to reject that cavalier dismissal of my clients' concerns," the lawyer said. A Manitoba government spokesperson declined to comment on specifics of the human rights complaint. "We must honour the privacy and confidentiality provisions of the Freedom of Information and Protection of Privacy Act and the Personal Health Information Act and refrain from speaking about the individual circumstances of the individuals who have filed this complaint," a written statement said. "We do acknowledge the challenging circumstances of these two individuals and commend them for their efforts to bring their concerns forward. The province will co-operate with the Manitoba Human Rights Commission to support a thorough review of this complaint to ensure that we have met our responsibilities under existing legislation and current policies to support people with disabilities to live with dignity in the community." Pastora Sala says her clients say they feel like they've been stonewalled by bureaucrats. Sylvester, who is visually impaired and uses a wheelchair, requires assistance in all aspects of day-to-day life including eating, dressing, grooming and going to bed, Pastora Sala said. He now receives income assistance of $500 per month and lives alone in a Winnipeg apartment. Home care offers some support but workers regularly change and do not offer consistency of care, argues Pastora Sala. The "rudimentary supports" Sylvester receives do not meet his social needs, she said. "This situation is a systematic failure."